Marlena was named one of Comedy Central’s Comics to Watch for the 2016 New York Comedy Festival, and has featured for ADAM DEVINE, APARNA NANCHERLA, MICHAEL CHE, AHMED BAROOCHA, GILBERT GOTTFRIED, and more. 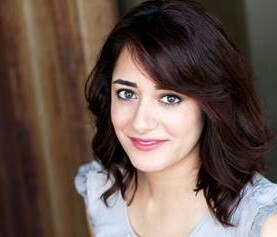 She's a multi-talented stand-up, TV writer, and alumna of Chicago's famous Second City Touring Company. In 2015, Marlena moved to New York to write for season 2 of Netflix’s Emmy nominated series UNBREAKABLE KIMMY SCHMIDT, and was nominated for a Writers Guild Award for Best Comedy Series. Marlena has produced original content for Broadway Video's Mas Mejor Network, including her digital series BOUNCERS, was a staff writer on TV Land’s LOPEZ, and worked with the creator of Regular Show on his upcoming TBS series, CLOSE ENOUGH. Most recently Marlena was a story editor on the upcoming Netflix series ALL ABOUT THE WASHINGTONS, starring Rev Run and based on his hit MTV reality show RUN’S HOUSE.